[SatNews] The Automated Transfer Vehicle (ATV) for Arianespace’s next resupply mission to the International Space Station is standing tall at the Spaceport as preparations continue for its heavy-lift Ariane 5 launch on Flight VA219. After completion of its initial cargo loading process in the Spaceport’s S5C facility, the ATV Integrated Cargo Carrier’s large aft opening is sealed (photo at left). This element was then mated with the Service Module to form the completed Automated Transfer Vehicle (at right). 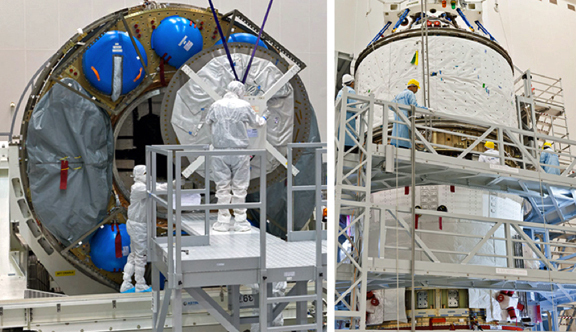 This past week’s activity in French Guiana included stacking of the ATV’s two primary components—its Integrated Cargo Carrier and the Service Module—completing the build-up process and readying the resupply spacecraft for final checkout ahead of its subsequent integration on Ariane 5. With these two elements now mated, the Automated Transfer Vehicle is at its full overall height of 10.7 meters. The ATV’s mating followed completion of the first phase of cargo loading into the Integrated Cargo Carrier, which took place in the Spaceport’s S5 payload preparation facility. This fifth and final European ATV—designated Georges Lemaître after the Belgian physicist and father of the Big Bang theory—is to resupply the International Space Station, as well as perform maneuvers to maintain the facility’s nominal orbit and test new rendezvous sensors in space. In addition to the fuel and air it will carry to the crewed space station, ATV Georges Lemaître will deliver more than 2,600 kg. of dry cargo. The ATV program is part of Europe’s contribution to the International Space Station’s operation, and is managed by the European Space Agency. Prime contractor is Airbus Defence and Space, which leads a European industry team. Airbus Defence and Space also is industrial architect for the Ariane 5. Follow Arianespace's launch activity at: http://www.arianespace.com/.